Bikes that are driven on the roads today come nowhere near the kind of imaginative model that a kid likes to see. When you see the bikes below, you kind of say…. ‘wow’ or else… ‘cool’. 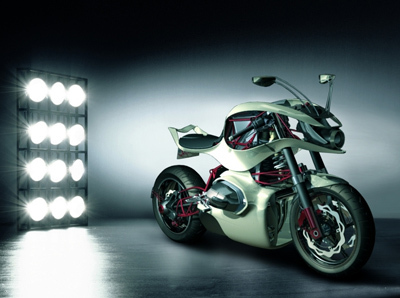 These are the concept bikes that artists/designers imagine the future motor cycles to be. See and enjoy. The design brief for the BRP EMBRIO Concept was to "create highly innovative, functional and exciting products to exceed people's recreational needs" and find the "next thing" in recreational vehicles. The result is a futuristic and minimalistic one-wheeler that is as about far away as you can get from the conventional image of a uni-cycle - a mode of transport normally associated with circuses and street parades. The BRP EMBRIO concept is one of several concepts proposed by Canadian based Bombardier Recreational Products and it received the Gold Award at the 2003 Annual Design Awards (Industrial Design Society of America & Business Week Magazine). The IMME 1200 concept motorbike was the creation of two French design students of the ISD (International School of Design). The IMME 1200 is based around the BMW R1200 engine. The name IMME comes from a now extinct German motorcycle maker. The IMME 1200 concept motorbike gained the interest of BMW who helped in the creation of a prototype for the 2006 Intermot Motorcycle Show in Cologne to go on show at the BMW stand. A slick trick of the BMW IMME 1200 concept bike is that all the parts needed to be road legal, license plates, lights, mirrors can be removed with the engine start key and then the machine becomes 'track ready'. Really just some amazing designs, great post.